You can now use Cortana to tell Photostream to update your lockscreen wallpaper! Just say: "Photostream update my wallpaper"
Photostream can also overlay weather info right on top of your lockscreen. Let Photostream update your lockscreen wallpaper for you automatically. 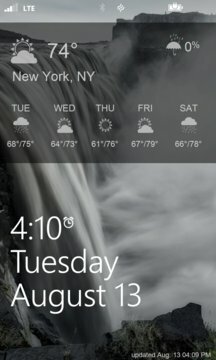 Set up photo sources from your local albums, OneDrive albums, Flickr, and 500px as a live wallpaper. Photostream is the most comprehensive live wallpaper app on the market, allowing you the most control over your lockscreen wallpaper. -Use Cortana to update your lockscreen wallpaper using your Photostream photo sources. -Set up your OneDrive albums as a photo source and manage your wallpapers from a computer or tablet. -Set up your local albums as a photo source. -Setup Flickr's interesting photos, a favorite group, a keyword search, or a user's photostream as a live wallpaper source. -Setup 500px photo sources: popular photos, editor's picks, upcoming photos, fresh today, fresh yesterday, and fresh this week photo streams. -Exclude photos of people from 500px photo sources. -Choose a specific 500px category. -Add multiple photo sources and let the app cycle through them automatically when refreshing your wallpaper. -See a history of your wallpapers and re-enable old wallpapers that you forgot to save. -Add discovered wallpapers to your "Favorites" list and use your favorites as a photo source. -Choose how often you want a new wallpaper, anywhere from every 30 minutes to once a week. -Arrange your photo sources in the order you want. -If you really like the current wallpaper, lock it in place until you're ready to automatically get a new one. 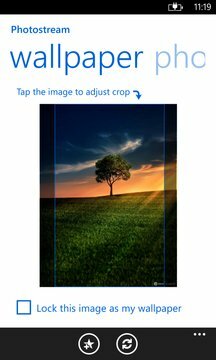 -Select the crop region of the photo.